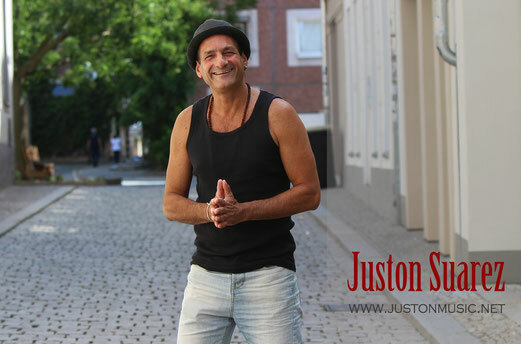 .The Song „Copia la talla“ Juston Suarez Songs, reached the semifinales oft the prestigious International Songwriting Competition in Nashville, USA 2011, whose jury included such personalities of the International music scene asTori Amos, Kelly Clarkson, Alejandro Sanz and Chayanne. .New Album ready 2013 „Ritmos y colores“ The long- awaited Album of Juston Suarez & Timbastars Band ist ready with 10 originals Songs ranging from Urban Salsa fusion until timba, and guest stars like Roman Diaz Anaya, Tony Martinez. .Tour and presentations in German TV with famous artists: Johnny Logan, Christopher lee (Hollywood Legende), Rhapsody Band from Italy, Milva, John Smile, Lena Valaitis, Marschal und Alexander, Jochen Kowalsky, Bernard Margarit & Francuba, Vanessa Calcagno, Vicky Leandros.
. Juston Suárez was the first percussionist in the electronic fusion project Extravaganza, together with Chucho Valdés (5 Grammys), Jorge Chicoy, Roberto Carcassés and Orlando Sánchez Cubajazz, including a performance at Cubadisco Festival 2003 as well as the recording studio under the label EGREM.
. Good review as percussionist in jazz festivals in Italy and Germany, among others.
. New Album production 07/2012 „Marketing“ for Orquesta Cubanisimo. Original Songs and guest stars like Giraldo Piloto, Sixto „El indio“ Llorente, Osmany Collado and Julio Padron.
. Since 2000, he is the lead singer of Cubanisimo, he has recorded with this orchestra festivals and events all over Europe. He is also a percussionist and singer in Chanchullo Sextet, a band that Afro Cuban Jazz has in its repertoire and in Cuba, USA a Asia is very popular.
. The first CD from the band was reviewed by some DJs and journalists with a very good critic and value (Bamboleo magazine rated with the maximum of 5 stars, for instance).
. 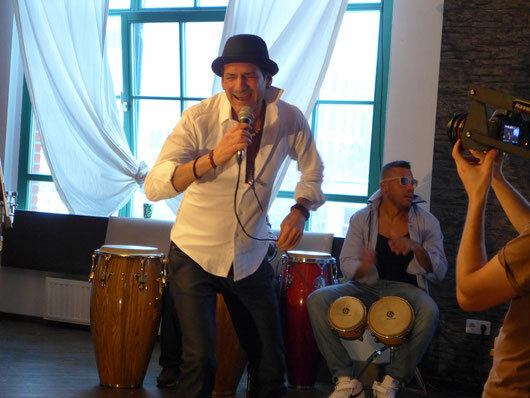 The song „Cubanísimo“ became an absolute hit in the Latin/Salsa club scene in Germany und Europe.
. Songs from the Cubanísimo album are included in several Sampler CDs like Havana Club Son Puro Cubano Vol. 1 and 2.
. CD Release Party in Hamburg with guests from Compay Segundo and Ramón Valle (Germany.
. Special private concerts for big companies and events like Nestlé, Panasonic, Springer & Jacoby, Grüner & Jahr, Heine Films, Das Werk, Hanse Merkur, Kadus Hairworld, Colgate-Palmolive, Volkswagen, Audi, Volvo, Mercedes Benz, Porsche, Sachsen Allee Chemnitz, among others.